"The key to cooking is thinking about what excites you and working with that" Heston Blumenthal. 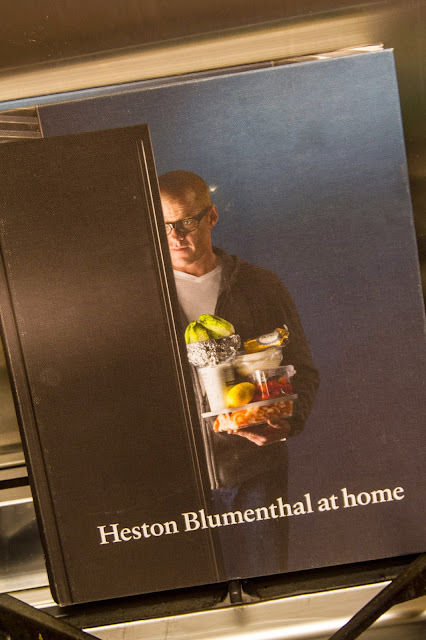 Isn't Heston super creepy lurking by the fridge in a darkened room. Oh and you can see that I have enjoyed this book by the fact that there is food stuck to the cover. There is a fine line between Molecular Gastronomy and Insanity. Heston Blumenthal is a self taught chef who walks the precarious tightrope between the two worlds. At times his modern day Willy Wonka persona presented on television has me wondering if Heston has over balanced and the insanity is taking over but his cookbook "Heston Blumenthal At Home" has me more at peace with Heston's ethos as a chef. Aimed at the home cook Heston presents a book that is very technique and science driven but leaves the more avante garde side of Heston back at his restaurant "The Fat Duck". It is a relief to have Heston explain that he is "not into complexity for complexity's sake" and his exploration of how all the senses and the brain factor into our enjoyment of food helps demystify the often overwhelming world of cooking. Heston goes on to explain that once he discovered the science behind the senses and how they factor into the appreciation of food, the kitchen become a more enjoyable, fascinating place. It is this enjoyment that Heston passes on through this book. He understands that with the knowledge he can impart he can bring a greater appreciation of food to the home cook. The recipes presented are an array of recognisable favourites such as baked potatoes and scotch eggs through to modern creations like Quinoa Sushi and Mushroom Jelly. To my surprise he doesn't go about trying to reinvent the wheel where perfection has already been achieved. The humble baked potato remains just that but with Heston's refined techniques the potato soars to new heights with the crunchiest outer coating and fluffiest centre you could ever imagine. Skill level and preparation time for the recipes also varies greatly. You have quick and easy recipes that pack a punch, like my new favourite potato preparation, Heston's Crushed Potatoes. As well as more complex dishes I am yet to delve into such as the "Szechuan Broth with Duck Dumplings" as the two days of preparation has so far been beyond my reach. As you would expect from an inquisitive if not slighty OCD chef like Heston there is an emphasis on embracing technology to expand your cooking repertoire. With Heston's encouragement our house has embraced the Sous Vide method of cooking whereby you cryovac your food to be cooked in a temperature controlled water bath. The results are as near to perfection as a home cook will ever get with any method of cooking. Proteins are evenly cooked all the way through to your exact requirements and mouth-wateringly tender. Our 72 hour slow cooked beef short ribs topped with Heston's Blue Cheese Butter was a revelation and we have even cooked scrambled eggs with Heston's Sous Vide technique. The results of which are so far from the dry cottage cheese-like scrambled eggs I have come to know from hotel buffets that there is no going back. Yes you have to pack in enough cream and butter into these things that your cellulite will be quivering in anticipation of a land grab but the rich, creamy texture topped off by a nutty browned butter will have you singing like you joined the gospel choir. Hallelujah Heston.